Salt of the Earth… a hot spot where great food is cool. So during our Labor Day weekend, we hit up NACL late on Saturday night. The kitchen is open until Midnight with the restaurant closing at 1am. Getting there at 15 minutes before the kitchen closed proved to be neutral (more on that later). Arriving at NACL however felt a little like going to the far side of everything since we were in Greentree and the restaurant is located in the Garfield neighborhood of Pittsburgh (about 8 miles and roughly 20 minutes). We made it in time and I was happy to see the place was not crazy busy with customers and/or a line to be seated. The atmosphere is well designed with an open concept kitchen that you see straight on from initially walking in the front doors. The main dining area with its communal/family style seating greets customers with large beautiful wood tables that utilize movable wooden blocks for seating. The design esthetic comes across as strong and from the earth itself. I always appreciate an open concept kitchen especially in this case where stools are positioned to sit at the counter, eat/drink and interact with the kitchen staff as meals are being prepared. There is a well situated intimate bar at the back of the dining area. It has limited seating yet contains a welcoming back-lit wall showcasing the various libation bases available. The mezzanine level above was hardly noticeable if it were not for the visually alluring slate wall used as the vehicle to showcase the ever-changing menu. The ‘chalkboard’ wall travels both stories up the side of the restaurant, from the dining area below to the upper level where reservation seating takes place and I presume a more intimate dining experience can be enjoyed. I truly enjoyed the menu wall given that it makes excellent use of the vertical space in the restaurant and focuses the guests on it as not only artistic but information as well. 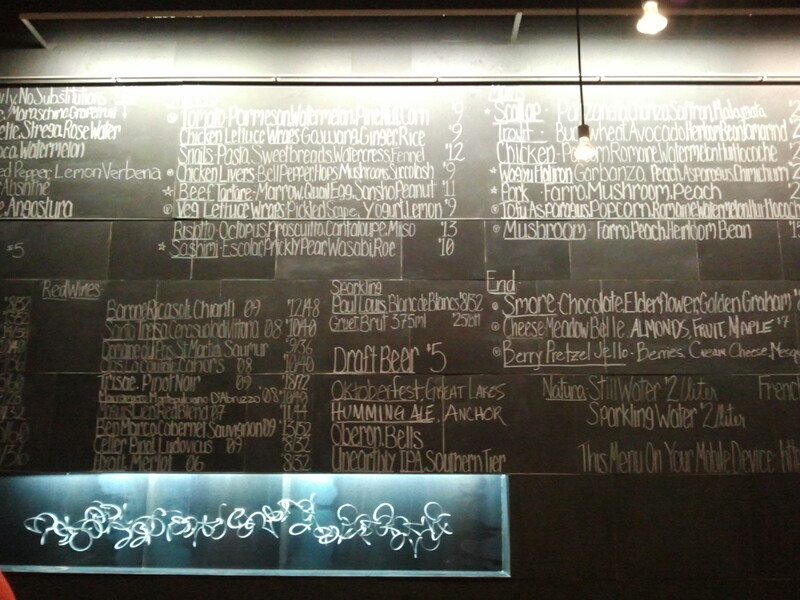 The wine list and cocktails are listed towards the left edge of the wall. As for the food we ordered, once again we were not disappointed in the selections we made nor in the options available. 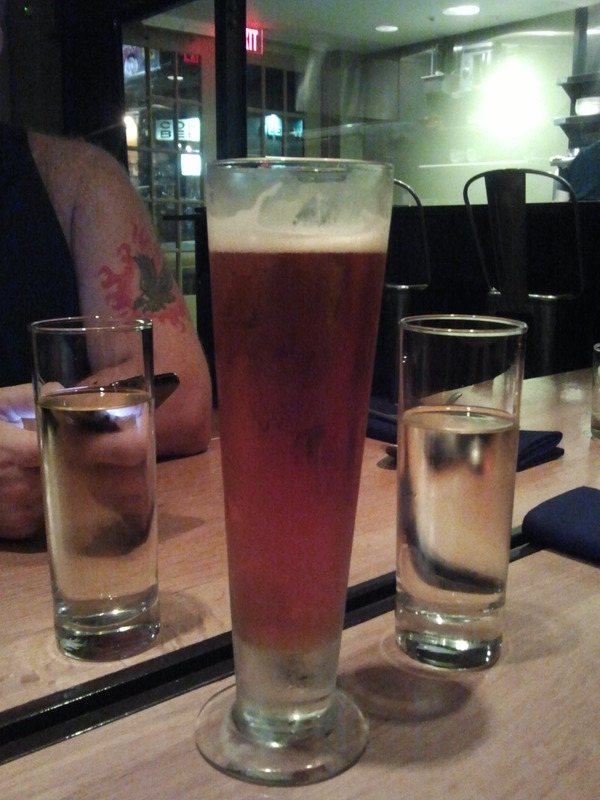 We decided on each getting different appetizers once again. This time Drew ordered their Chicken Livers with Bell Peppers, Hops, Mushrooms and Succotash. I personally am not a fan of liver, regardless of the animal, but I must say that this dish was well-flavored and spot on with its ingredients/description. William made a bold choice and got the Escargot (aka Snails) with Pasta, Sweetbreads, Watercress and Fennel. Again not something I am fond of but as we have done in the past, we passed plates and tried a bite from each other’s dishes. I bypassed the snails/sweetbreads and found the pasta and sauce to be tasty; appreciating them separately from the other components. 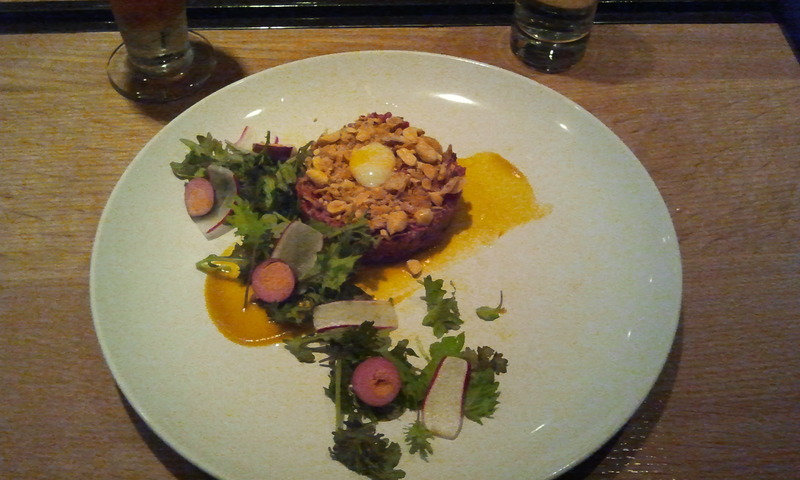 I myself made a bold move of sorts and ordered the Beef Tartare with Marrow, Quail Egg, Sansho and Peanuts. I personally have had tartare in the past but have been rather quiet in discussing it with anyone, especially those close to me. When folks find discover that tartare is a raw meat preparation, the squeamish-ness comes out. I have to admit that in my past the thought of eating raw meat has not been desired but then again, life is an adventure so treat it as such. There were two versions of quail eggs included in this appetizer; pickled and raw. The ‘schmear’ below the beef tartare was made with curry which is one of my sweet spots. I highly enjoyed this dish for its variety of ingredients and mouth-feel; from the soft meat and egg yolk to the crunchy greens, radish slices and rough chopped peanuts (resembling crumb topping). And with the main part of our meals, we continued the dining adventure. Drew and I chose similar dishes with Drew ordering the Pork Loin with Farro, Mushroom and Peach. 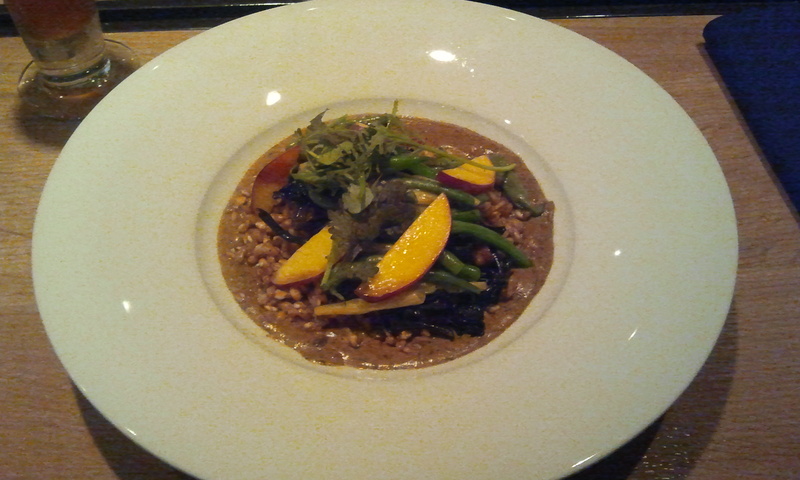 I went the vegetarian route and got the Mushroom with Farro, Peach and Heirloom Beans. Drew’s dish had by far some of the BEST pork I have tasted in quite some time. It was juicy, savory and succulent. Notably Drew and I agreed that his farro was not as flavorful as mine was; presumably due to mine using mushroom stock. However notably I think Drew’s farro was cooked more in comparison to mine. My farro was more toothsome and not quite al dente where as Drew’s was cooked through and had a less chewy consistency. I found the mushroom base rich and satisfying while the heirloom beans provided a pleasantly fresh crunch factor. The peach slices helped lighten the dish with firm fruity highlight. Ah yes the traditional end of the meal… which in this case we did not get to enjoy. 😦 Due to the kitchen closing at midnight, we were informed by our server that ordering dessert was not possible. I was disappointed that we were unable to order a dessert to share which each other. We had agreed that directly due to the richness of our dishes, the Meadow Belle Cheese plate with Almonds, Fruit and Maple was the best of the three choices listed on the menu. The Pretzel Jell-o dish spoke to me from the 50’s/60’s and didn’t really move me personally. The S’more spoke to my inner child’s memories of camping in the woods. However as a dessert to order in a restaurant, I was not looking to eat a sticky, gooey dish. Therefore the cheese, nut and fruit plate was most likely to be light and a nice finish to the meal. To avoid getting on a soap box here, I just want to say that as a previous restaurant manager I felt this wonderful meal came to an unpleasant ending. Several things could have been done to avoid the unfortunate lack of having dessert from the business end. Technically we could have arrived sooner and made sure were there to order before the kitchen closed. However the staff could have done things to ensure that we had a most pleasant end to our meal. I would have to say that Salt of the Earth is a great new addition to the culinary scene in Pittsburgh and recommend folks check it out. The decor is great as well as the dishes Chef Kevin Sousa has prepared. The atmosphere is inviting and I would guess makes for an interesting experience with the communal seating arrangement downstairs. As for kids, I would not necessarily ever expect to see them in this space. Granted the time frame we were there would have proved rather striking to see children at 12:30am. So if you’re in the mood for a nice meal out with friends or someone special, I would consider Salt of the Earth toward the top of the list. This entry was posted in Foodie Adventure, Gary's Stuff, Main and tagged ale, beef tartare, bell peppers, chicken livers, chorizo, escargot, farro, fennel, heirloom beans, hops, kalamata, marrow, mushrooms, panzanella, pasta, peach, peanut, Pork, quail egg, saffron, sansho, snails, succotash, sweetbreads, watercress. Bookmark the permalink.